Added on April 14, 2019 by sabine kussmaul. Attending the lecture by Dr. Sam Elkington, Teeside University, 11th April, Chester University. 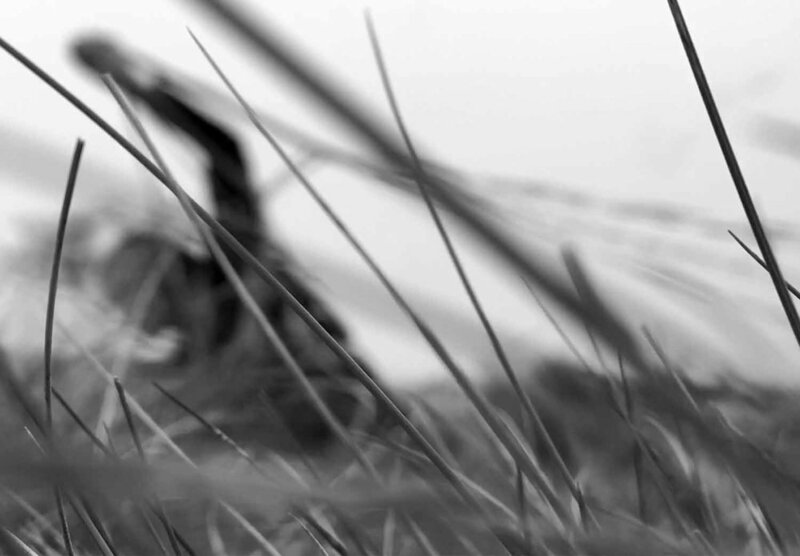 There is Method in the Madness: Grasping at meaning in Phenomenological Research. Some key considerations. Participation on the walk ‘This land is our land’ organised by Simon Woolham. I took along a scroll of drawings. The scroll showed pencil drawings of common birds of Europe. Whilst on the walk, I added further drawings with sharpies onto the drawings.. Participation in Incendiary, a group show in three locations around Stroud, organised by Patricia Brien, in protest of the new rubbish incinerator in Gloucester. My contribution consisted of a range of drawing and burning activities that I documented through text, photographs, video and the remains of the burning process. In the studio, I made drawings of rubbish. Then, I propped up these drawings outside, and set fire to them. Photographs and the remains of the drawing’s frames got exhibited in the gallery. I had also written a text which was an invented ‘interview with the pyro-practitiner’: A question-and-answer text revealed the haunting qualities of the burning process. 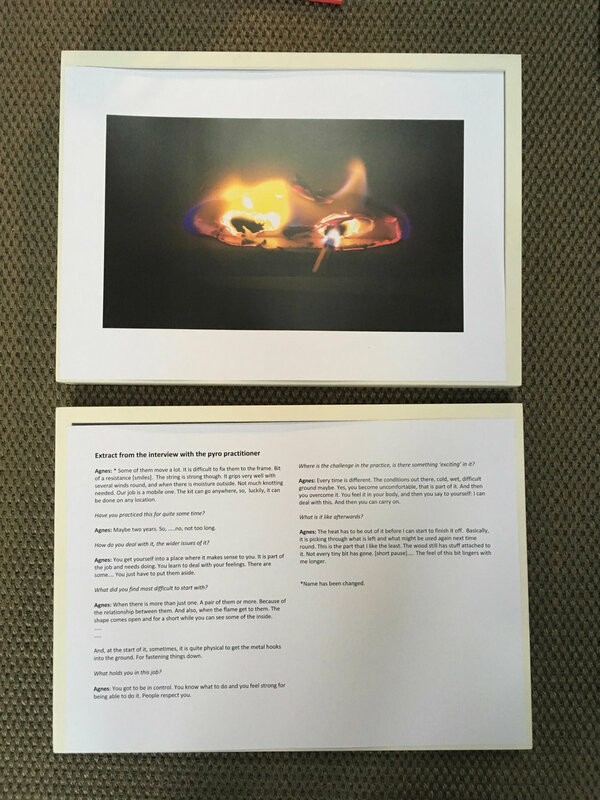 The text was framed and accompanied by a close up photograph of a flame, also framed. Participation on walk with Kel Portman and Dr. Richard Keating around Stroud in connection to Incendiary exhibition. I took scrolls of drawings (showing birds, drawn with pencil on paper treated with wax and oil) along the walk, and added further line whilst we walked along. 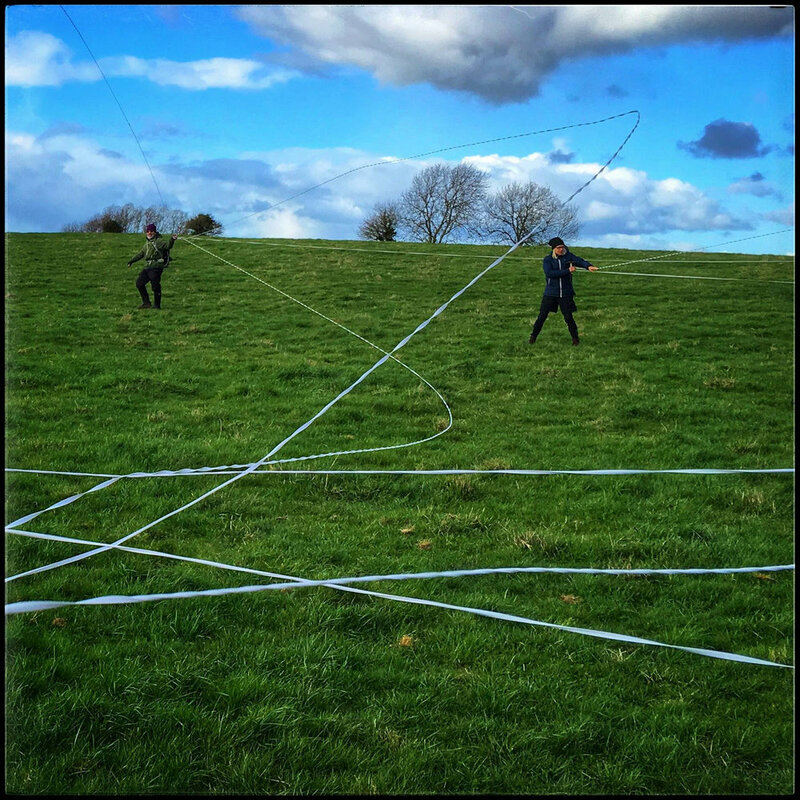 I also took many meters of elastic line and participants on the walk tried out connecting themselves and space through the flying of the lines in the wind. 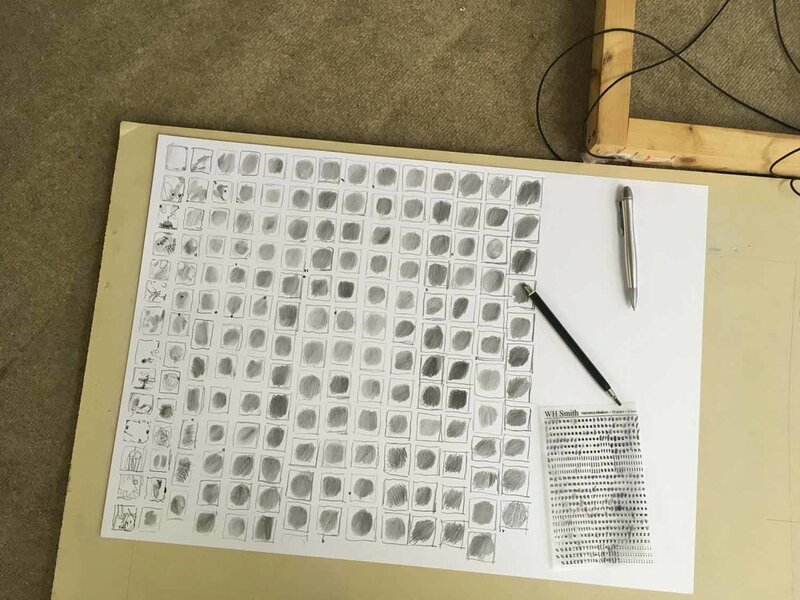 Indoors drawing, body and scale. Added on June 1, 2018 by sabine kussmaul. 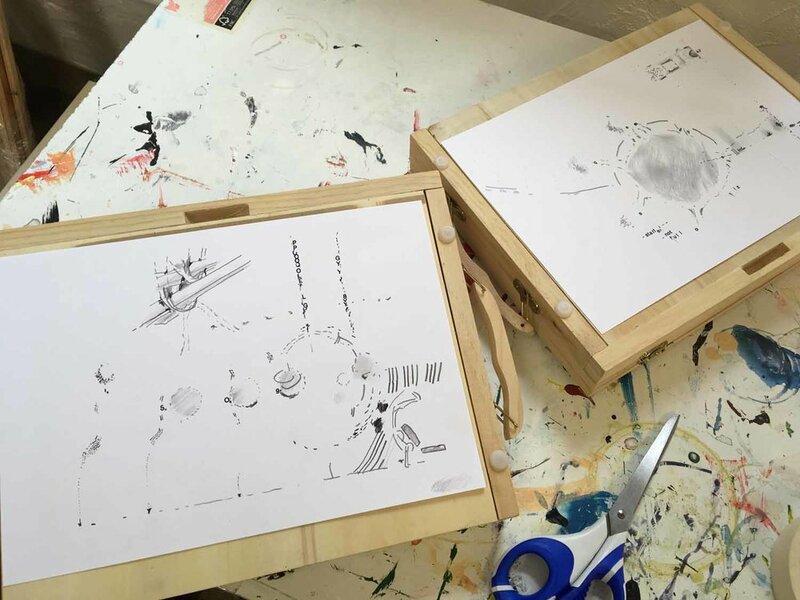 I wanted to explore through drawing what I could sense in our studio. And what was to be perceived from the confines of my drawing board, as I shared it with the drawing in the making. So I assigned myself to draw stood or sat on the drawing board, for two hours, not leaving the space. Whenever 'the next moment marked itself out through a change in the environment, I made another 'marker'. A marker to provide a focus and platform for my own attention but also to mark the moment in its very individuality. I wanted to find out more about the role that movement played in the context of my work. And to what extent it really mattered that physical strain was involved or not. And, was it necessary at all to move myself from one place to the next, like I did with running? So I sat in a field, with plenty of warm clothes, doing nothing. As I don't want this post to be very long, I will try to summarise very briefly the mostly interesting points. Initially, perception seemed to be just what I heard, saw, smelled. Then, after a while, the previously perceived seemed to just be the surface of a wider perceptive context. And the the surface became porous. I felt, that different perceptive elements, like a sound from somewhere and a colour seen elsewhere, appear to become in relation to each other, and eventually also to be in condition of each other. Things became personified, subjectified. The experience of sound was particularly surprising as it seemed that I could draw myself closer to sound or further away from it. Like sound had that particular quality to allow me a choice how I wanted to relate to it. Attached to many metres of white line, all untidily unravelled on the floor, I set off. The line still keeps moving,...in connection to me....and I am nearly out of view. Who experiences the journey? The viewer? The runner? What moves? The shadows on the hills? As the storm Ophelia was forecast, I wondered if I might take the opportunity of experimenting with 'line and self' up on the hills close to Pott Shrigley in the Peak District. Added on October 3, 2017 by sabine kussmaul. A very complex theme but I am totally intrigued how the visual is being used to describe music in a notational way different from classical musical notation. Braxton's many ways of notating music can provide guidance for performing players and improvisors. Visual artist Natalie Newsome (www.natalienewsome.com) and myself took to the hills on a windy Saturday morning. We both wanted to try out how it might work if two people entangle themselves in lines and respond through movement and interaction to the situation. Natalie has recently graduated from UCL, The Bartlett School of Architecture in Architecture and Interdisciplinary Studies. She has made a short film putting together video footage of the morning. I find it particularly interesting around the 2:07 min mark, when two people are moving about. I joined a figurative drawing session with some friends. 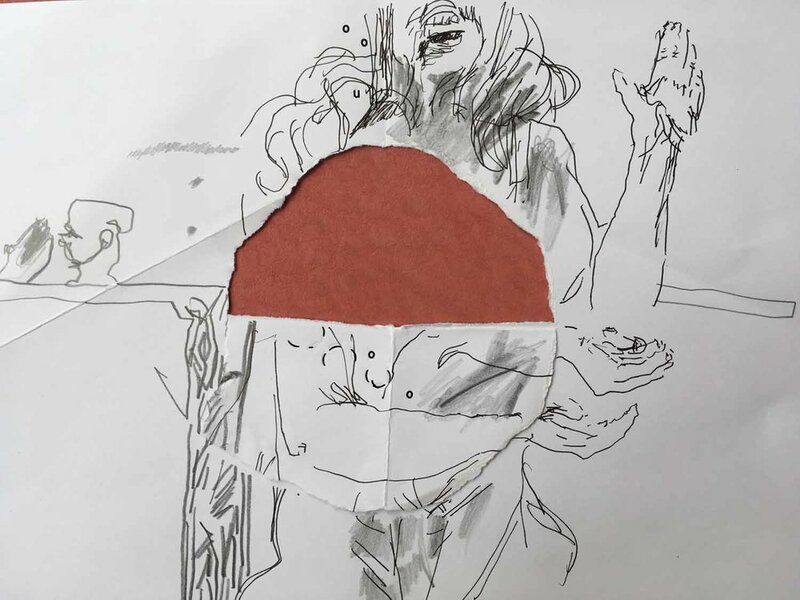 I made these drawings with the intention to play with and challenge the scheme of figurative representation and how this interacts with letters and with manipulating the paper surface.